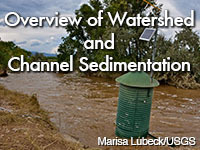 This lesson provides an overview of the primary influences of watershed and channel sedimentation. In a short narrated portion of the lesson, we explore a section of the Rio Grande watershed and channel in New Mexico using Google Earth imagery, river profiles, and graphic animations. We highlight features of the upland catchments, the river channel, and the Elephant Butte Reservoir. We then demonstrate how environmental factors (climate, geography, land use changes, reservoirs) impact the supply and movement of sediments for the Rio Grande and other rivers. The focus is on the three primary processes in sedimentation: generation, transport, and deposition. The lesson then addresses natural climate and weather influences along with some observed and projected trends associated with climate change. these are excellent trainings, im proud and honored to be able to do these trainings, as thes are also my fields of interest, as i grew up on discovery channel, national geographic, the great outdoors, etc. Six stars! Creative use of Google Earth, and well-done animations paired with up-to-date climate change information and more traditional material. Conveys a lot of information in a relatively short module. Excellent for the non-specialist. Summarize the primary sedimentation processes described in published studies. Identify and describe river and watershed features that indicate sediment processes such as erosion and deposition. Explain the relationship between sediment supply/movement and precipitation, including precipitation rate, timing, and form. Describe the impact of human activity and infrastructure on the sedimentation process. Describe the role of climate and weather in the watershed sedimentation process. Outline the possible changes to sediment supply, transport, and deposition in a changing climate, including uncertainties and the currently observed trends.